FEMALE WITH WHITE MARKINGS! WILL BE HUGE ! This Great Dane nicknamed Dakota 9 sold and went to a new family. 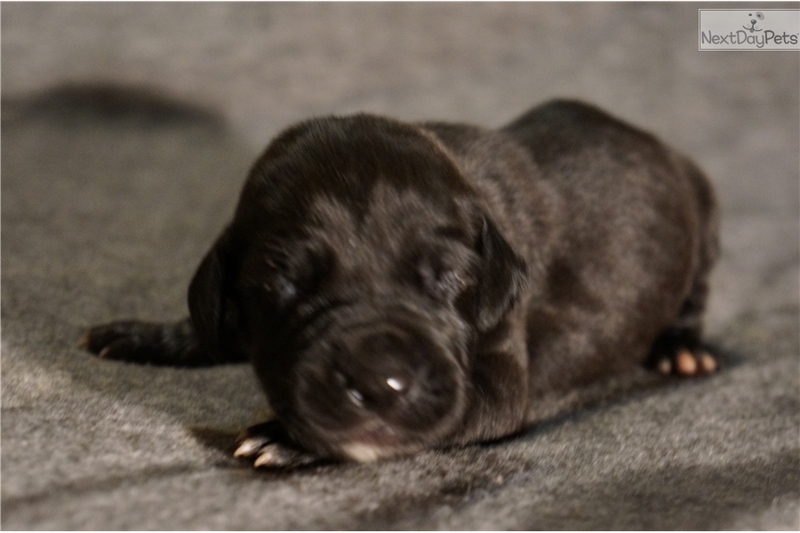 DAKOTA, OUR GORGEOUS 50% EUROPEAN MANTLE AND MOJAVE 100% EUROPEAN SOLID BLACK POLISH IMPORT HAD 9 BEAUTIFUL PUPPIES ! ADORABLE JET BLACKS ! THESE COLORS ARE THE MOST POPULAR! RESERVE YOURS NOW ! THEY WILL NOT LAST LONG! THESE BEAUTIFUL PUPPIES ARE 75 % EUROPEAN. EACH PUPPY COMES WITH A FULL A.K.C. REGISTRATION, 3 YR. HEALTH GUARANTEE(AS LONG AS PUPPY IS KEPT ON NUVET TABS FOR 3 YRS) MICRO CHIPPED, DEWCLAWS REMOVED, UTD ON PUPPY SHOTS GIVEN BY THE VET. VET CHECKED ALL THE WAY ALONG, DEWORMED HEALTH RECORD, PUPPY PACK, LIFE TIME BREEDER SUPPORT ! MOJAVE'S PUPPIES ARE IN DEMAND ! RESERVE YOUR PUPPY TODAY! THEY WON'T LAST LONG ! PICK OF THE LITTER IS STILL AVAILABLE! TO A LUCKY CUSTOMER !